In 1942, the Hon. Mrs. Ronald Greville left her jewelry collection to Queen Elizabeth (later The Queen Mother), "with my loving thoughts." Part 1 of our look at the Greville bequest filled in the background on Margaret Greville and her association with the royal family. It's an important thing to understand, because her jewelry collection directly reflected her personality and societal aspirations. In Part 2, we'll look at her jewels, what we know made it into that bequest, and what we don't know. She was drawn to jewels with powerful provenances just as she was drawn to powerful people themselves. Among pieces said to have been in her collection were a diamond necklace rumored to have belonged to Marie Antoinette, emeralds reported to have come from Empress Joséphine, and a diamond ring with alleged ties to Catherine the Great. Other accounts of her collection list pieces of great variety. Mrs Ronnie by Siân Evans mentions several items, drawing from society reports of the day: a sapphire necklace, a wide diamond bandeau to wear on the head, diamond stars from her husband as a wedding gift, other wedding gifts including a diamond tiara from her father and an emerald bracelet, a collection of black diamonds, an enamel and diamond bracelet from India, ropes of pearls, tremendous amounts of diamonds and emeralds, and more. Boucheron by Vincent Meylan describes additional jewels commissioned by Margaret Greville, including spectacular diamond necklaces, a valuable pair of large pearl earrings, and others. 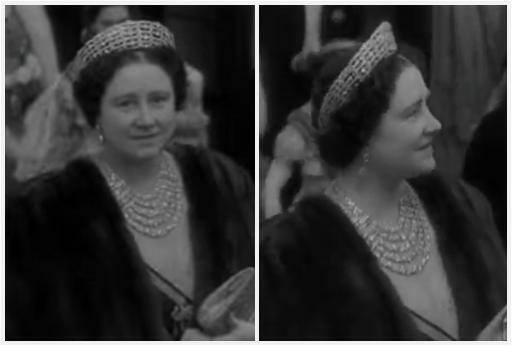 Then there were, of course, the large diamond tiara and the magnificent five strand diamond necklace we know today. She was a loyal and important customer of both Boucheron and Cartier, where she maintained a steady stream of commissions including maintenance for her existing collection. A long necklace of 210 pearls and multiple other pearl necklaces were sent to Boucheron yearly for restringing, for example. She also had her older pieces redesigned regularly, keeping her current in jewelry trends. What we know today as the Greville Tiara was redesigned more than once, as were other pieces. Her penchant for updates means that any of the pieces listed above may or may not have still been in existence when she left them to Queen Elizabeth. "I must tell you that Mrs Greville has left me her jewels, tho' I am keeping that quiet as well for the moment! She left them to me 'with her loving thoughts', dear old thing, and I feel very touched. I don't suppose I shall see what they consist of for a long time, owing to the slowness of lawyers & death duties etc, but I know she had a few good things. Apart from everything else, it is rather exciting to be left something, and I do admire beautiful stones with all my heart. I can't help thinking that most women do!" 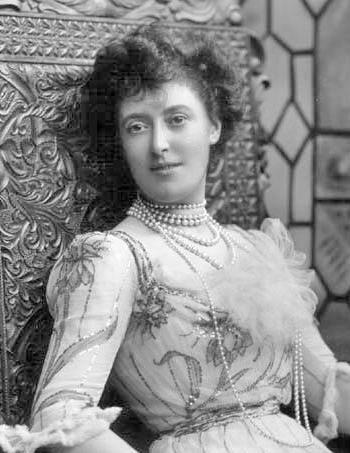 "How kind of Mrs. Greville to leave you her jewels, and she had some lovely pearls and nice emeralds too I think. [...] I can understand your pleasure about the jewels, you are right not to say anything about them. [...] I never had any such luck - but I am not really jealous, I just mention this as it came into my mind!" The two queens discussed keeping the gift quiet, but it wasn't a secret for long. Speculation over the fate of Mrs. Greville's wealth - including those jewels, for which she was well known - ran high. 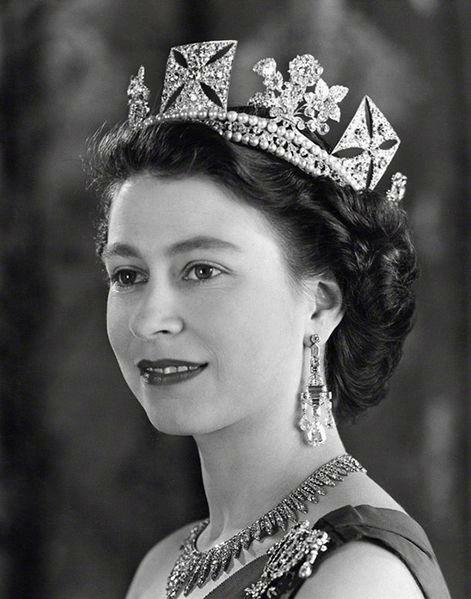 The will was made public, and the gift of jewels to Queen Elizabeth was discussed in news reports of the day. 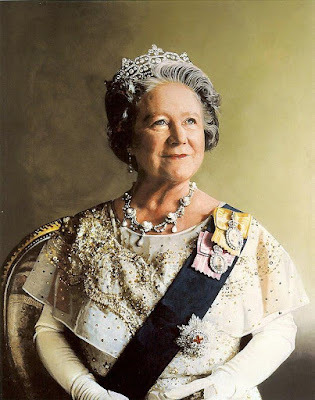 By 1947, the Greville jewelry was in use by the royal family. Queen Elizabeth wore the Greville Tiara during the royal family's visit to South Africa that year; during the same visit, the Greville Ivy Clips were gifted to Princess Elizabeth for her 21st birthday. 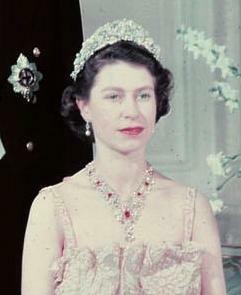 Later that year, the Greville Chandelier Earrings and the Ruby and Diamond Floral Bandeau Necklace were given to Princess Elizabeth as wedding gifts. A reluctance on the part of George VI for his family to use jewels obtained in this fashion is sometimes claimed (perhaps without much source), but the more logical reason for the relatively short delay was probably sensitivity to the war and post-war austerity. Even as the jewels were put to use, the true origins of these "new" pieces often remained private. The Greville Tiara - the most recognized piece in the bequest, and an instant favorite of The Queen Mother's - was commonly referred to as a new commission by The Queen Mother for several decades. The Queen's Diamonds by Hugh Roberts, published in 2012, newly revealed the Greville background of other familiar pieces. The complete contents of that black tin box marked with the initials M.F.G. are still emerging more than seven decades later. An inventory of the complete contents of the Greville bequest has never been made public. The best approximation of its total size comes from the Roberts book, which places the collection at over sixty pieces. Pieces that have been identified as Greville jewels formed a key part of the collection worn by Queen Elizabeth in her years as The Queen Mother. All remaining items from the bequest in her collection on her death in 2002 went to The Queen with the rest of her possessions. These items are today worn by The Queen and by The Duchess of Cornwall on loan from Her Majesty - a fitting association, given that Camila's grandmother, Sonia Keppel, was Mrs. Greville's much-beloved goddaughter. Listed below are jewels associated with the Greville bequest. Some are confirmed, and some are only the source of speculation (click the pictures or links to read more on each piece.) It includes only jewels that have been covered on this blog to date. The Duchess of Cornwall's Engagement Ring: The origins of this ring are debated. Some suspect the Greville bequest, many disagree.